Happy Flash Friday everyone! A few months back we looked at the 1967 Filmation cartoon, The Chemo-Creature (you can check that article out by clicking here). 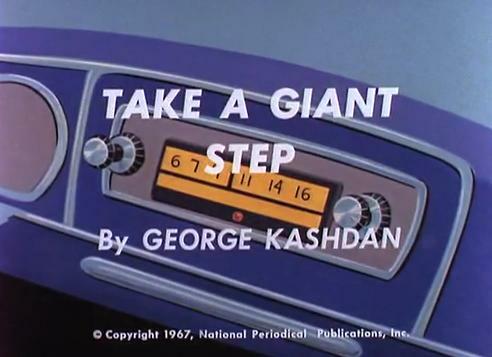 Today we look at the second episode, Take a Giant Step. 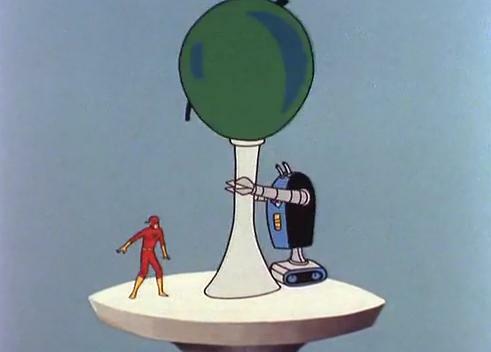 Giant Step is the first Flash cartoon to include Kid Flash, although Filmation also used Wally in their Teen Titans cartoons. As with all the write ups, this one is a little long. Hit the link to keep reading. The episode starts with Professor Crag wanting to test out his newest invention, a robot suit. Barry Allen is driving around in his convertible and listening to the police band on his radio. I guess that sounds like a fun way to spend an afternoon. 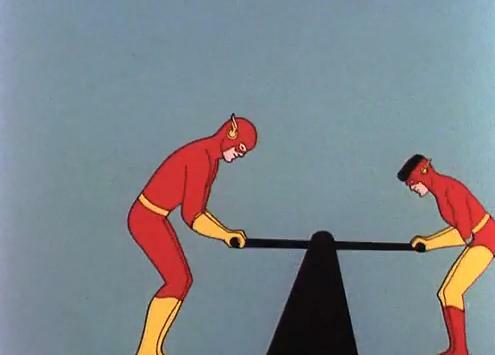 Regardless the report of a giant robot attacking the countryside comes over the radio and Barry calls for Wally to help him. 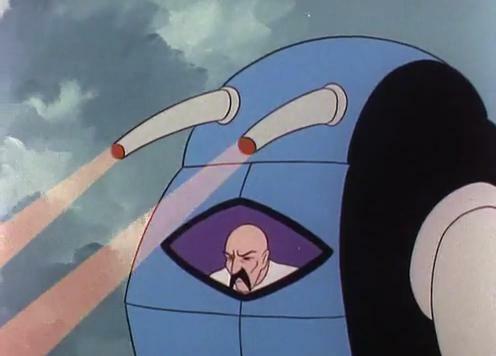 Before Flash and Kid Flash arrive on the scene Crag uses the robot’s droopy lasers to destroy a random car. I call them droopy lasers because the actual lasers are sloped down to face directly in front of the robot. It’s possible that they were perky when the robot was younger, but now they just look worn out. Also this is a good moment to point out that Crag has an epic moustache. 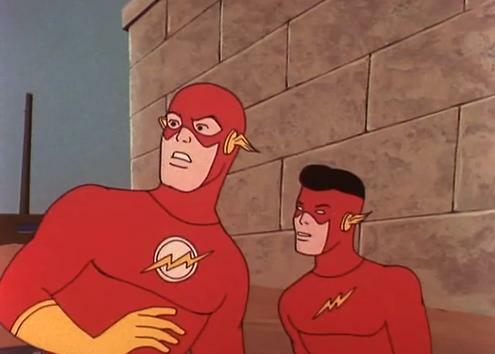 Flash and Kid Flash run up to confront Crag’s robot only to have Kid Flash immediately grabbed and thrown by the robot’s claw. They decide to use a rock formation to roll boulders down at the robot. After Barry tells Wally his plan, he takes off towards the boulders while Wally yells out, “Go, go, go, Flasher!” Yeah, the Filmation version of Wally is pretty special. Wally also has an interesting color combination, the red and yellow on his costume are pretty much reversed from the comic’s look and his hair is black. The rocks pummel Crag’s robot, but he not only destroys them with his droopy lasers, he also shoves a railcar towards an oncoming train before flying off. The next part is almost surreal. They Flashes jump onto a handcar, race up to the runaway car, hook up to it, and then speed it off to a side track before the train hits it. After saving the train Flash comments that only one man was smart enough to build the giant robot, totally ignoring that the thing has a windshield built into its chest. The two head off to Crag’s laboratory to question him and are thrown down a trap door. Crag then boasts that he did indeed create the giant robot and that the other robots he has made are going to kill the Flashes. Crag then gloats, “Now I’m off to the science fair to reap vengeance on those who scoffed at my robot creations.” Barry and Wally run through the robot’s lighting blasts only to be trapped in a room with other robots that threaten to crush them against the wall. 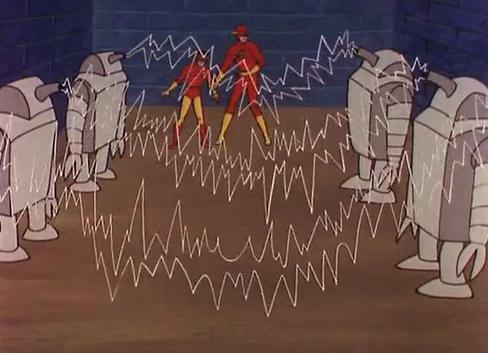 The Flashes vibrate themselves through the wall and then race off to the science fair. Crag is using his robot to destroy the futuristic looking buildings. This science fair is apparently a big deal; it looks more like the old World’s Fair then anything else. Flash knocks Crag off one of the buildings and leaves him in a crater. They then send two unmanned planes at Crag who easily manages to dodge them by using the jetpack on his robot. 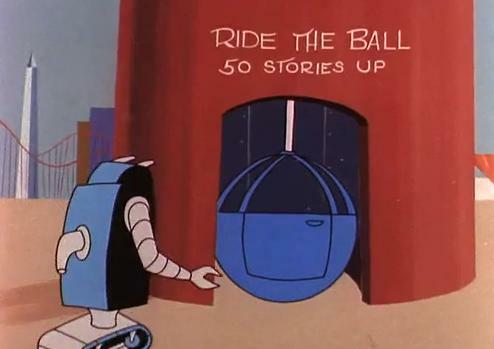 Crag goes to an attraction called “Ride the Ball”. Yup, I said ride the ball. Crag rips the ball off and plans to use it like a giant ball and chain. Flash runs into the balls path though and wraps Crag’s robot up like he was playing a game of tetherball. Crag is taken to jail where the Flashes show up for no other reason then to taunt Crag. Once they’ve belittled the defeated villain they race off into the sunset together. That’s it for today’s Flash Friday. I’m doing some renovations in my Flash display at home, so next week we’ll probably have some pictures of they new setup if it is completed in time.